History, a reflection of the past, is everywhere around us.The world is full of sites that inspire us to look back on the past whether it be in a way that makes one feel happy or somber. Lower Manhattan, New York City is one such place. As the financial center of the United States’ economy, Lower Manhattan is one that is awe-inspiring in its architecture; buildings extend into the sky like the trunks of massive trees. One building, however, is different from the rest. One World Trade Center reaches 1,776 feet into the Manhattan sky. The World Trade Center, is not just a center of commerce, it is a memorial to what came before. 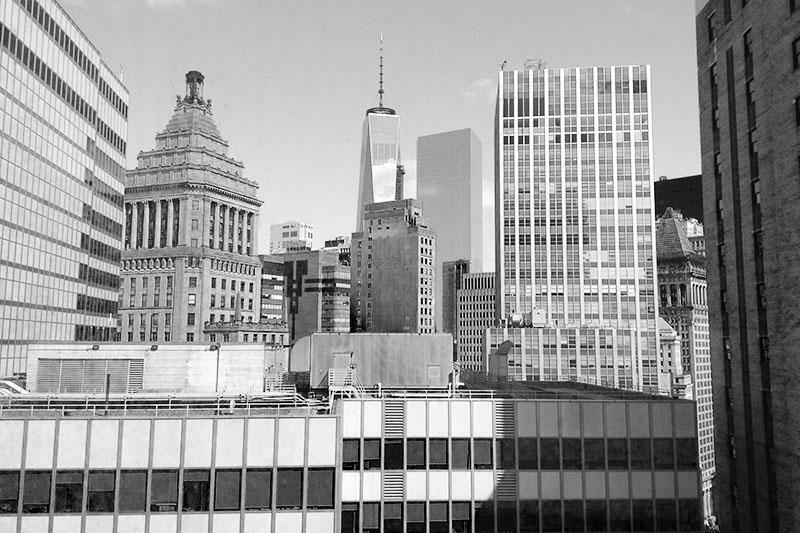 This photograph consists of the New York skyline in March 2014. The photo looks out the 40th floor of a Manhattan hotel at the freedom tower, as the building is in its final stages of construction. In September of 2001, I stayed with my grandparents in Ithaca, NY., 200 miles north of Manhattan. The 9/11 attacks occurred when I was one, and despite the fact that I remember nothing specifically from that day, the event completely changed the way the United States operates both politically and socially. Those who were too young during the attacks, such as myself, have no idea of what the world was like before and how it has since changed. The World Trade Center as the focal point of the photograph, draws the viewer into the photograph and towards the idea of reflecting back on history. The manipulation of the light by the surrounding skyscrapers also gives the viewer an ominous feeling, looking back on the emotions that surround the attacks and the aftermath. The photo, however, not only gives the moment captured an ominous feel, but one that is also melancholy. The composition of the photograph, with the tower in the middle, creates almost a pathway for the viewer to follow with the building itself at the end. The pathway is almost a metaphor for our generation’s understanding of the impacts of 9/11. Today, we tend to look less at the past, and more towards the future. History to much of us is a class we learn, it is not anything more than a credit we need to get out of the way, but in reality, it is so much more. We learn about the impact of the attacks in school and as a result, end up looking at the skyscraper through a lens which previous generations have created for us, despite the fact that many of us were alive during the attacks and have seen the impacts. Some reflections are looking at oneself, some are looking into the meaning of literature, art or other forms of self-expression and others are reflections of the past and the ability to look back on how history has changed us. Sites like Ground Zero and the new One World Trade Center, are meant to represent reflection, and memorials like these are vital in our understanding of the past and how 9/11 impacts the world we live in. Are there any historical landmarks that have caused you to reflect on your past? Comment below.